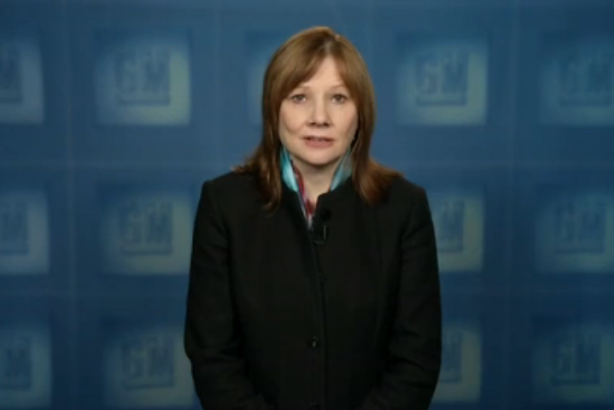 In General Motors' latest communications efforts to limit any reputational marring from its ignition-switch recall crisis, CEO Mary Barra admitted the company's faults and reiterated a focus on customer safety in an internal video broadcast to staffers. In General Motors’ latest communications efforts to limit any reputational marring from its ignition-switch recall crisis, CEO Mary Barra admitted the company’s faults and reiterated a focus on customer safety in an internal video broadcast to staffers. She announced three safety recalls, bringing the tally of recalled GM vehicles to 3.3 million worldwide since mid-February, with the majority of those in the US. Government officials are investigating why the company took more than a decade to recall the Chevrolet Cobalts, which may be responsible for at least 12 deaths. "Something went wrong with our process in this instance, and terrible things happened," Barra acknowledged in the video, which was posted on GM’s site on Monday. "As a member of the GM family, and as a mom with a family of my own, this really hits home for me. We have apologized, but that is just one step in the journey to resolve this." Aside from the personal angle, the main point of Barra’s announcement was GM’s focus on the safety and peace of mind of its customers. She said the company will be better because of this "tragic situation," but only if it seizes the opportunity, adding that its system for deciding and managing recalls will change. The video encompassed a laundry list of what the company has done since faulty ignition switches led to a recall of 1.6 million cars last month. Thus far, outreach methods have included the mailing of recall letters to affected owners last week. GM has also beefed up resources at call centers to handle customers’ questions about ignition issues, and dealers are handling customer problems on a case-by-case basis. "We are putting the customer first, and that is guiding every decision we make," said Barra. "How we handle the recall will be an important test of that commitment." She also mentioned that GM will send a recall service bulletin to dealers the week of April 7, explaining the issue and the process for getting the switches replaced. Follow-up letters will also go out next month to customers to let them know that parts are available. The company has also created a global vehicle safety role to handle issues Barra addressed, such as identifying and resolving product-safety concerns. Reporting to GM’s VP of global vehicle engineering John Calabrese, Jeff Boyer will take on the role and become a member of the global product-development staff, led by EVP of global product development, purchasing, and supply chain Mark Reuss. Boyer was previously GM’s director of engineering operations and systems development. Prior to that, he served as executive director of global interior engineering and safety performance. In a March 4 letter to staffers, Barra said in response to the crisis that the company has created a working group of executives that she will lead to direct GM’s response, monitor progress, and make adjustments as necessary. She also launched an internal review to give the automaker an "unvarnished" report on what happened.